Advertiser.ie - Do you think you are a comedian? Do you think you are a comedian? HAVE YOU ever been to a comedy gig and thought ‘I could do that’? 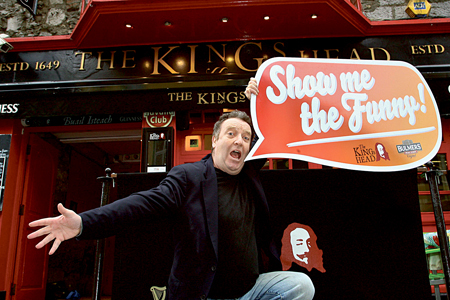 Well, now is your chance with a new competition from The King’s Head in association with Bulmers. The competition, Show Me The Funny will search for the freshest new voice in comedy and will provide aspiring and would-be comedians the opportunity to showcase their talents in front of a live audience. The eventual winner will go on to perform at the Comedy Stage at this year’s Electric Picnic Festival, have a slot in The Laughter Loft during the Galway Arts Festival, and receive a substantial cash prize. The first of four heats will take place at The King’s Head on Monday February 28 at 8.30pm and the next three subsequent Monday’s with the grand final on Monday April 4. Gerry Mallon will be the MC for all of the shows with a surprise special guest comedian performing at each heat. A panel of industry experts and audience votes on the night will decide who goes through to the final and there will be loads of give-aways and goodies for contestants and audience members. If you think you have what it takes to become the next Tommy Tiernan, then check out Show Me The Funny on Facebook or www.thekingshead.ie for details on how to enter. Admission is €5, which includes a free pint of Bulmers for the first 60 people.